I have so far only posted lovely reviews. That is because I tend to go by word of mouth, and the coffee community is generally pretty sharp at sniffing out the new good places – and even at recommending the competition. I went to Spicer and Cole simply because I ran past it on my way to the Downs one day, and the sandwiches looked appealing. I could see that the coffee was from Extract, which is popular in Bristol at the moment, so I thought the place ought to be decent, although nobody had flagged it up. Oh, how wrong I was! My boyfriend was gigging a Saturday morning, so I decided to pay a visit to Spicer and Cole. Have a coffee, sample a sandwich and do some writing. I arrive at about 11:30 and eye two sandwiches on the bar. I ask the girl at the till, whether I could perhaps have a sandwich made up as I do not care much for brie, which was the filling in the two on display. She tells me that more sandwiches are currently being made in the kitchen, but I will have to wait until noon before they are ready as they do everything from scratch. I like that, so I decide to order a flat white to have while I wait. I pay for my flat white and sit down. The coffee does not arrive, but sandwiches do appear on the bar. Hence, I get up and ask if I could purchase one. The girl says that they are not for sale until noon, and I will have to wait. She then orders the two young kitchen staff to remove the sandwiches again, which they promptly do. I sit down and continue waiting for my coffee. It has now been 20 minutes. My coffee finally arrives at noon. I wonder what took them so long, but I do not ask. It is perfectly nice, but not excellent, and by now I really need it. After finishing, I get up and make another attempt at purchasing one of the sandwiches, which have now reappeared and seem to be for sale. I choose a piece of foccacia filled with fresh mozzarella and grilled vegetables and rocket. I also order another flat white. So far, so good. While paying, I see the girl about to put my sandwich into the panini toaster. I tell her that I would like my sandwich un-toasted, to which she replies that it is not possible. I repeat that I would like my sandwich un-toasted, and she says that sandwiches must be toasted. Period. Then she turns around and ignores me, but puts the sandwich aside. I wait. Another girl appears and asks me whether I am being served. I tell her that I am not entirely sure, but I do not think so. This prompts the first girl to turn around, hissing ‘she wants her sandwich un-toasted!’ They both turn to look at me, and the second girl explains that it would simply not be a good idea. You see, the sandwiches have been in the fridge for hours and are terribly cold, and the bread will be dry. I point out their conflicting stories, and reiterate that I just want the sandwich as it is. I am hungry. I do not want a toasted sandwich. It turns out that at Spicer and Cole, the customer is never right. I cannot buy a sandwich unless I have it toasted. End of story. 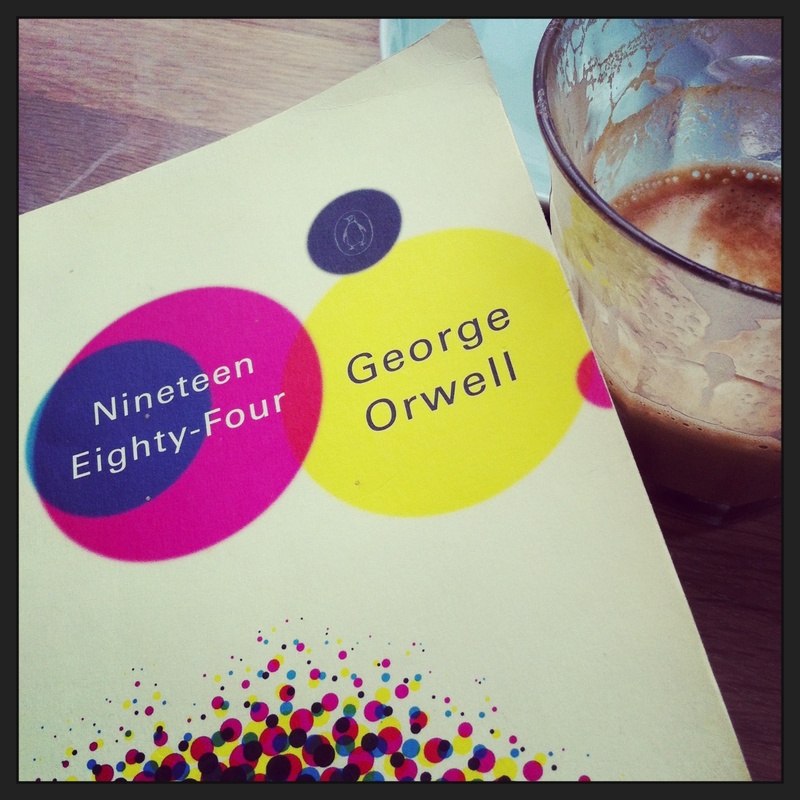 I pay for my second flat white, sit down and write a bad (but highly deserved) review, and do some reading. I also rather pettily occupy an entire table with my lone coffee for three hours on what is a busy Saturday. In all fairness, I did try to spend more money, I just was not allowed. I can see from the decor that Spicer and Cole has spent quite a bit of money on their outfit in Clifton. Here is a suggestion for you (in addition to using the superb Hart’s Bakery, rather than Hobbs House): if you have not run out of cash, do invest in staff training. Your customer service is non-existent. I shall never return. Not in a million lightyears. Not even if you paid me. There are excellent places to have coffee in Bristol – most notably Full Court Press and Small Street Espresso (post to follow) – so why go to Spicer and Cole, unless you want to raise your blood pressure and cry with frustration. Appears to always be open. 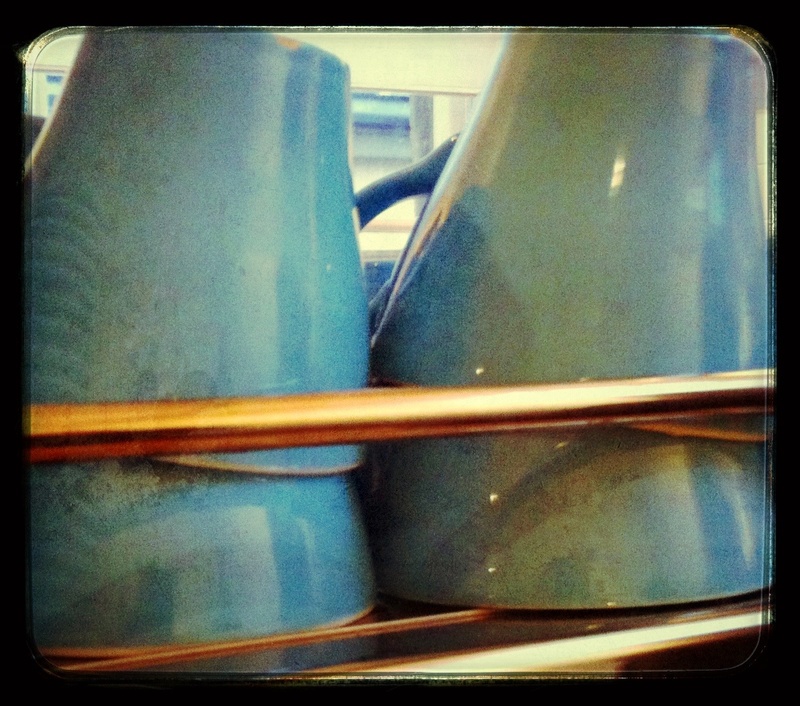 Anyone who reads this blog will have realized by now that I am a coffee geek. I am rather particular about my coffee. I like it strong, but with some milk in the morning. Just so my stomach does not burn entirely. I also like my coffee to be fun. Or challenging. I want to learn and explore new tastes. To me coffee is very similar to wine. I find both absolutely exhilarating. 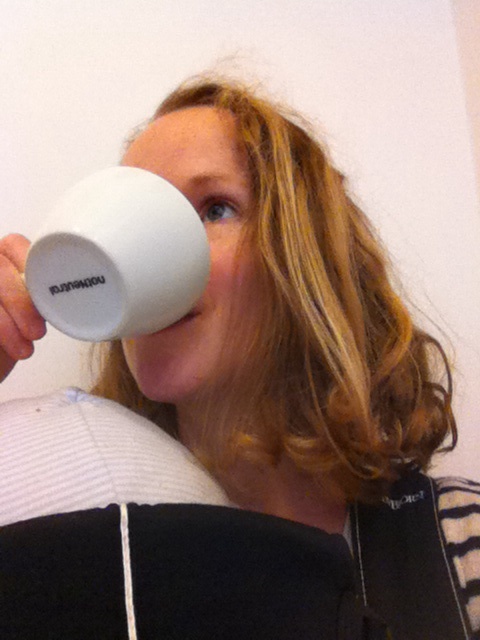 So far, I have written a few rather nice blog posts about coffee. I shall write some (or at least one) not so nice ones too. This is not one of those, because the Exploding Bakery is my absolute favourite coffee place in the UK. Their coffee is the best, the morning banter is how it should be, the guys are lovely as well as knowledgable and passionate about what they do, and their cakes are excellent too. And that is coming from someone who does not actually care very much for cake. Let’s begin with the coffee. Because, to me, this is really what the Exploding Bakery is all about, even if it is technically a bakery. While there are a number of guest beans appearing on a regular basis, such as e.g. a rather fantastic Roundhill take on the Ethiopian Hunda Oli Co-op, the standard coffee at the Exploding Bakery is my all-time favourite Monmouth. Monmouth is virtually impossible to get in the Southwest – I am yet to come across it in Bristol on more than a fleeting basis – so the Exploding Bakery is like a small piece of heaven to me. Due to space restrictions (connected to the fact that it is a bakery rather than a cafe), the coffees at the Exploding Bakery are all espresso based, that is, save for the rare event when the machine breaks down. The espresso based way suits me just fine. 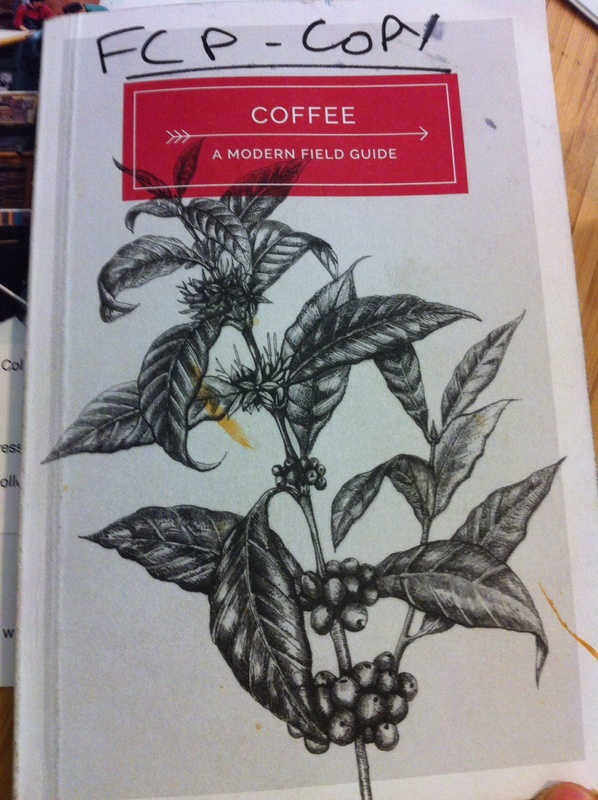 Either I am not hipster or grown up enough to appreciate filter/aeropress/cold extractions/etc. And the espresso base suits Monmouth. 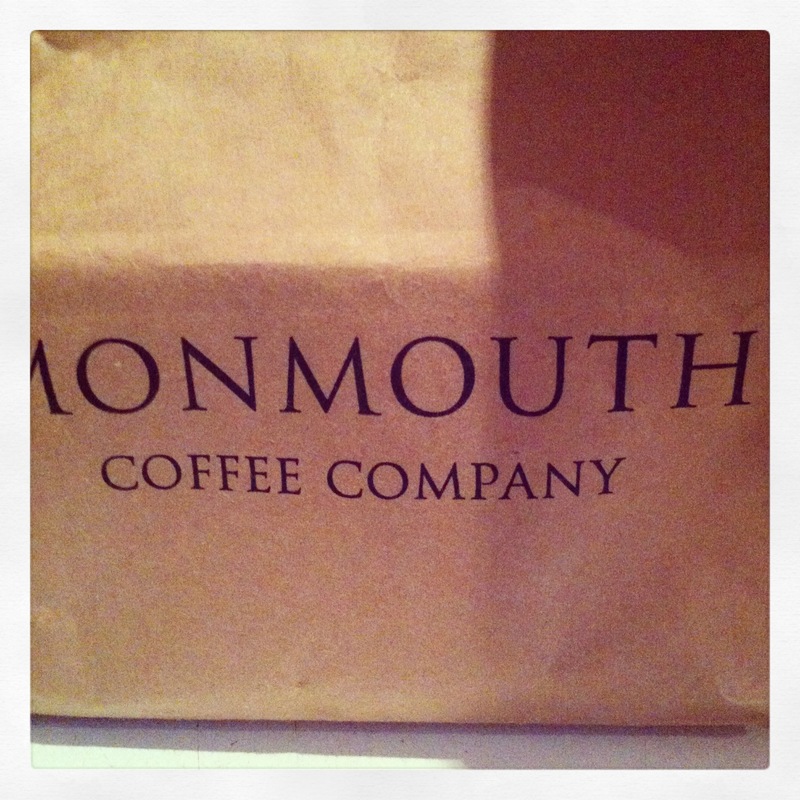 Monmouth is quite dark, but it is awesomely nutty, chocolatey and spicy. Nice and warm and rounded – perfect with a little milk to add a hint of sweetness. The milk is full-fat, by the way, as the Exploding boys do no frills coffee: one base, one kind of milk, one price. 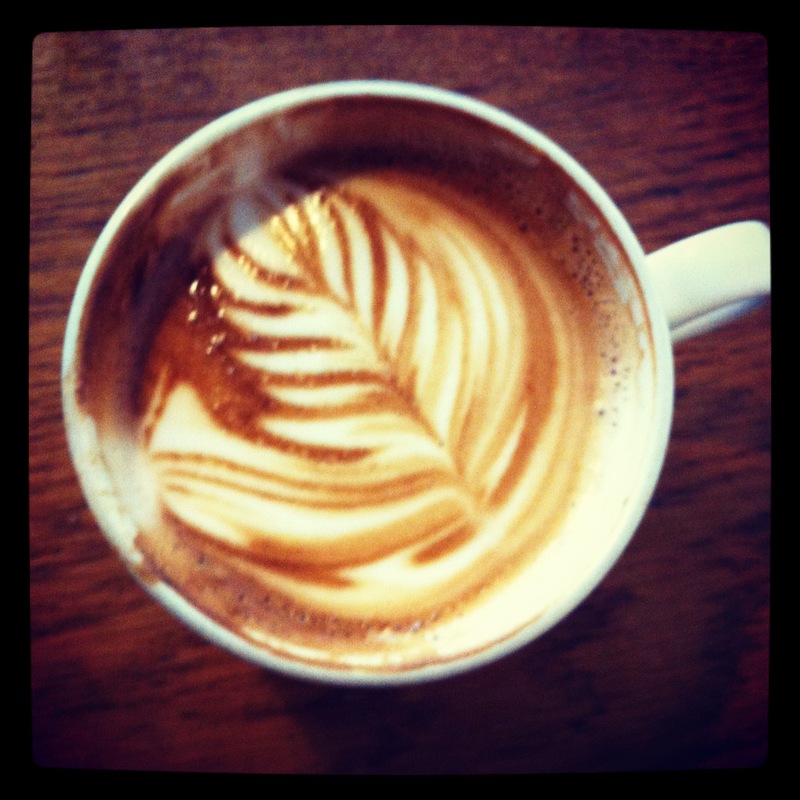 £2 for any coffee, whether an espresso or the milky latte, which so many people seem to like (but, why?!). I shall admit that I have never tried Monmouth or an Exploding Bakery coffee as anything else than a macchiato or a flat white. I like my coffee strong. Hence, whereas I cannot vouch for how the others taste, I can tell you that the boys make the best macchiatos and flat whites. Not only in town, but in the Southwest. 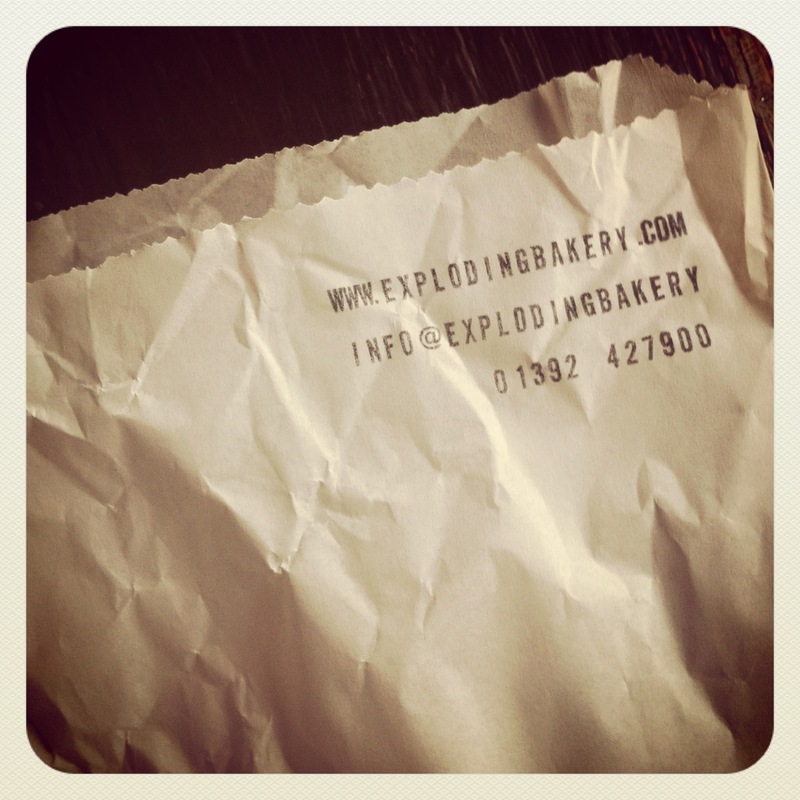 In addition to the great coffee, the Exploding Bakery supplies great morning banter. There is always a great atmosphere in the bakery – laughs, jokes and high-brow political discussions on food and World affairs. Just what you want on the way to work! Something to get you kick-started and put a smile on your face. Should that not be enough, there are also a vast assortment of cakes, some croissants (filled at lunch-time), Spanish tortilla (lunch-time), soup, and soda bread. I am not really much of a cake person, but if I had to buy a piece of cake anywhere, it would be either a slice of their lemon polenta cake or banana bread. The kid and boyfriend both agree, and they are both massive cake lovers. Open Mon-Fri 8-4, Sat 9-4. If you fancy a look at their cakes, which can also be bought to take home by the tray, do go to their website. Plenty of pics. And before you shoot me, I know Exeter is not in Bristol. In fact, it is an hour away. But there is no point in having an Exeter tab, because there is only one place to go for good coffee in Exeter (and outskirts). That place has now been covered. I like coffee. In fact, I love coffee. And geeky foodie conversations. Both can be had at Full Court Press, and the place has somewhat of a Scandinavian feel to it, although the candles are missing (just saying). Going to FCP is, in short, a pleasure. i have heard people say the place is pretentious, hipster and cold. I don’t think so! The guys are passionate about coffee, they are always welcoming (and smiley), they guide you through the coffee menu if you wish (regardless of whether you are an afficionado or not), the music is certainly not hip (or loud), and while the decor is by no means traditional English, it is certainly nice – Scandi spartan, clean, shabby chic. What is wrong with that? Makes me feel right at home. 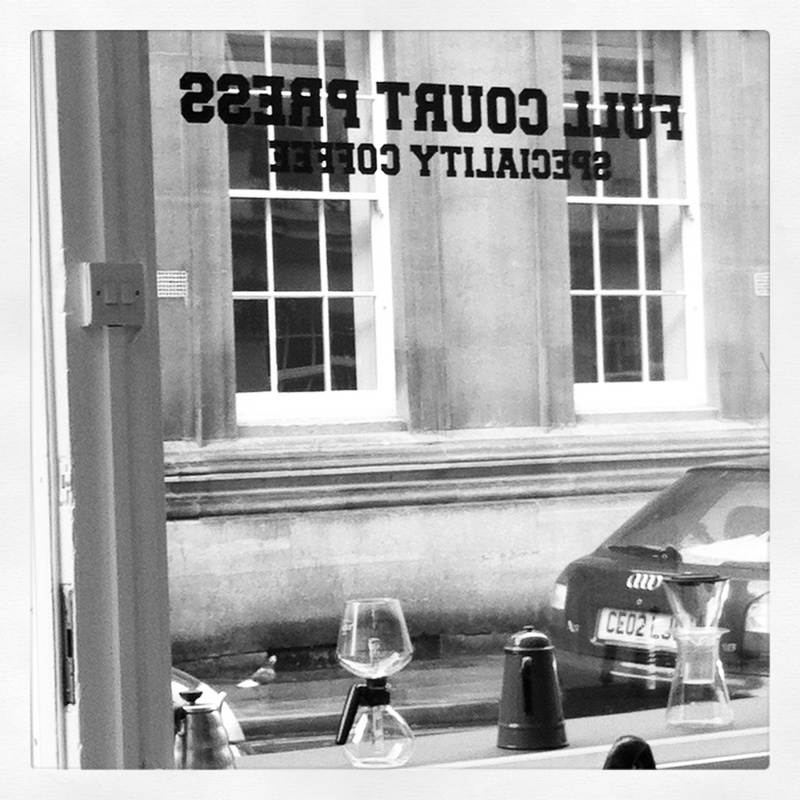 I have sampled various beans and roasts at FCP over the past year, usually made as flat whites or cortados. 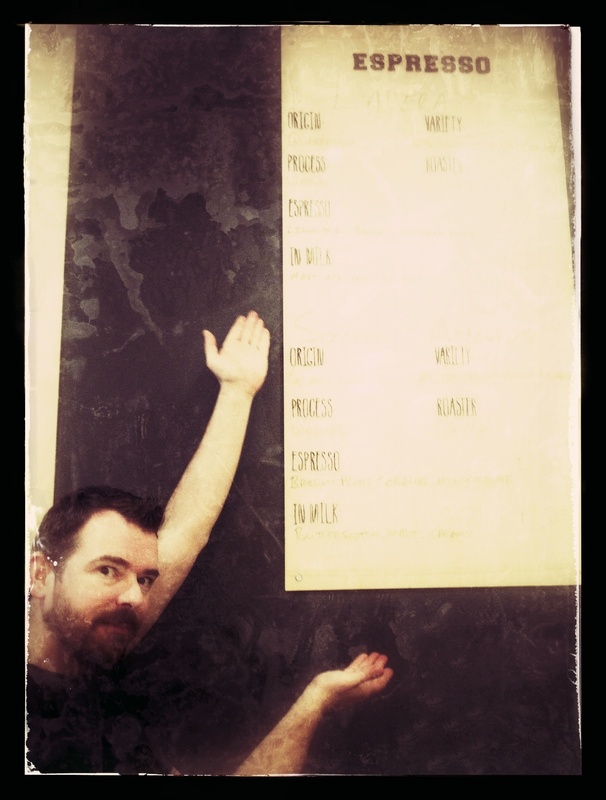 Often the suppliers (bean selection changes weekly; there are two to choose from) are well-known: HasBean, Clifton, Extract or Square Mile. I would like to see Monmouth, and I dream of Koppi, Tim Wendelboe and the Coffee Collective (as does the owner), but I understand why, at present, this is not possible. Scandinavian shipping costs are simply too dear. Not many people would pay £7 for a cup of coffee (outside of Paris, that is). 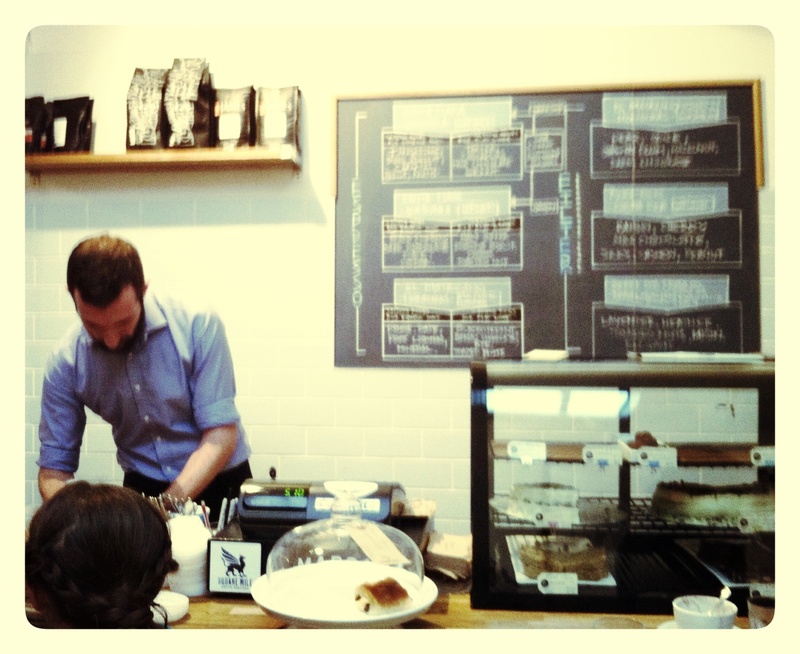 Today I had a cortado made with beans from Guatamala supplied by Square Mile (Ladera; washed). It was delicious – citrussy without being sharp, bold without being harsh. Just delicious on a late, rainy afternoon. 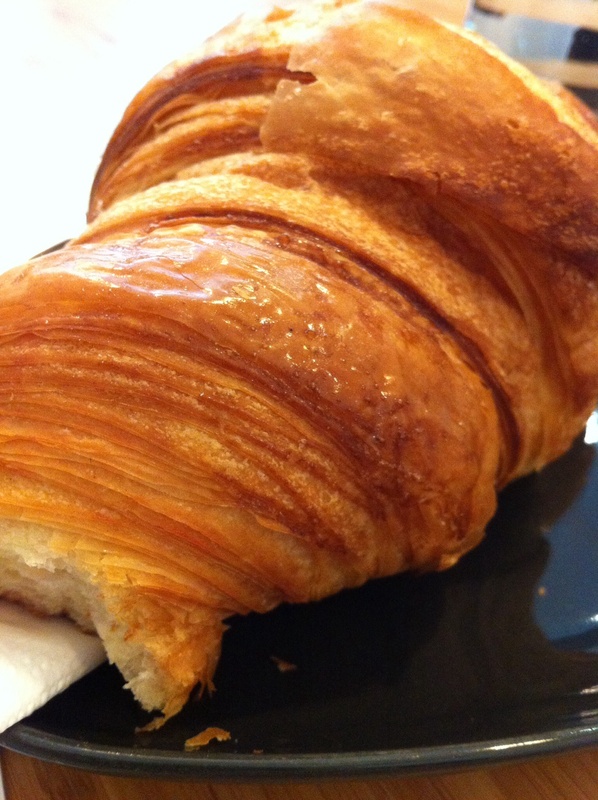 I shall be back for further delights – coffee, banter, and Hart’s bakery produce. And if they start stocking single origin dark chocolate too – which no other place seems willing to do due to low profit margins – FCP will unquestionably be my first port of call when out for a coffee in Bristol.